Attempting to list colleges and universities with the best services for students with disabilities ultimately demonstrates the problems in creating a list of the “best” of anything. When dealing with disabilities, so much depends on the individual needs of the students so what is ideal for one student won’t work for another. Never mind the fact that an institution’s approach to accommodating students can also heavily rely on one or two persons’ attitudes. That said, students with disabilities and their parents are going to need to generate a list of colleges and universities to consider. There are a variety of resources available to help families look for the best colleges for students with disabilities. For a quick overview of the situation read College Application Help for ADHD Students and Advice for Applying to College When You Have a Learning Disability. You should also read Resources for Applying to College with a Learning Disability for more ideas on how to deal with disabilities when applying to college. The LD Online Website has an entire section devoted to college. EducationQuest provides “College Planning for Students with Disabilities” as a free supplement to the “College Prep Handbook.” Be sure to visit the National Center for College Students with Disabilities (NCCSD) and checkout their Clearing House of Information and Resources. The National Center for Learning Disabilities also has numerous resources devoted to college including a listing of 15 College Programs for Kids With Learning and Attention Issues. The list indicated if there is an extra fee but not how much. Prep Scholar has their own listing of The 18 Best Colleges for Students with Learning Disabilities. It includes a description along with any extra fees charged, some of which are quite hefty. Mission Possible: A Guide to College Programs for Students with Disabilities includes an overview of a limited number colleges with specific programs for students with disabilities. The College Solution has a list of colleges for students with disabilities recommended by a college consultant who works with teens with learning disabilities. Both College Magazine’s rankings, the Top 10 Best Colleges for Students with Learning Disabilities, and BestValueSchools’ list of 20 Best Value Colleges for Students with Learning Disabilities provide program descriptions but don’t mention any additional costs. You can find a list of 50 Best Disability Friendly Colleges and Universities by College Choice with descriptions of the disable student services offices notes free programs. 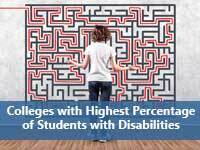 CollegeXpress has a list called The Experts’ Choice: Colleges Where Students with a Learning Disability Succeed but it doesn’t provide any explanation as to why the schools are included on the list. Since the idea of 50-50 Colleges is to provide students with more choices, I’m listing the 50-50 schools with the highest percentage of undergraduate students registered with the institution’s office of disabilities services. Of course, this doesn’t say anything about the quality of the services, just that they have registered for them. This gets back to the problem of lists–only two of the colleges listed here are among those recommended by the college consultant. Use at your own risk.